6 1/2 x 3 1/8 in. In the late 1960s, Michael Vienneau's parents rented a house on Nantucket. Michael and his older brother Larry started buying whale teeth from local gift shops. The brothers learned scrimshanding together, always trying to outdo each other as the artist relates, "By 1974, I was making a living scrimming on the Island, with my brother Larry doing the same thing just down the street." Michael earned a BFA in printmaking but is self-taught in the art of scrimshaw. The skills he acquired in etching, engraving, and carving apply directly to the making of scrimshaw. 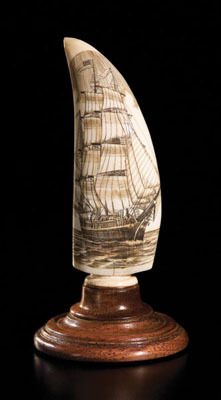 Michael Vienneau used a sperm whale tooth from pre-1972 stockpiles to make this scrimshaw, which depicts a Colonial Bark under full sail.